FordCares Warriors in Pink Whats It All About? + Giveaway! I know a lot of you are like me and have lost someone dear to your heart to cancer. Chances are we all have lost a friend or family member to this horrible disease. That is why this is a topic I am very passionate about. Any and every chance I get to sport cancer research and those who are suffering from it, I do so. One way I support is I donate my hair to Locks Of Love and I will be doing this again very soon. However I can only do it about every other year as it take s me that long to get my hair to the length that they need. So I have been trying to find other ways to show support. Then I heard about FordCares and their Warriors in Pink line. So I wanted to find out more. With FordCares you can pick one of four charities to receive 100% of the net proceeds from the Warriors in Pink line. The charities that they let you choose from are Susan G. Komen for the Cure®, Dr. Susan Love Research Foundation (DSLRF), The Pink Fund and the Young Survivor’s Coalition (YSC). They sent me a Warrior Swing Tank Top to try out to see what I thought about the quality of the item. Well I think I have a new favorite tank that I will be wearing all summer! I am someone who is fuller figured so finding shirts for me can be a little tough to do. They are either to short so that I feel like every time I lift my arm you can see my back or stomach. Or when I order a larger size so that it is longer and actually fits my chest area, the arm holes end up being so big that you can see my bra. Well this was not the case with the Warrior Swing Tank Top. It fits perfectly! It’s very light and soft, and will keep you cool in the summer. So the next time you want to do some shopping, please think about buying items from the Warriors in Pink line. So that they can continue to support these wonderful charities. And no it’s not just for women. They have a whole selection for men and kids. They even have car decals that you can get too. Be sure to show your support and like them on Facebook, or you can follow them on Twitter. You can let them know that Couponing for Freebies sent you. The people over at FordCares, are so generous they said that they would give one of my readers a Warrior Swing Tank Top too! 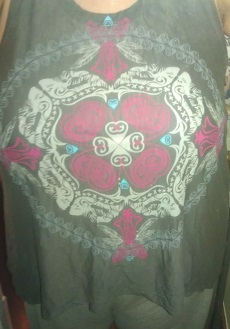 It is available in sizes S, M, L, XL & 2XL. So its time for a giveaway. With this giveaway there will be one winner. It is open to US only and you must be 18 years of age or older to enter. Void where prohibited. Use the giveaway tool below to enter. Too bad Canadians cant enter. An aunt was diagnosed last week and we are all looking for ways to support the cause. Thanks for sharing! I like a lot of their stuff, but I really like the Unstoppable Tee. I like the PJ pants! I really like the sister hoodie and the dream catcher pj pants. 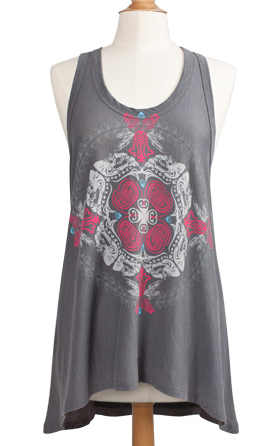 I really like the Warrior Swing Tank top, it looks really comfortable. I like the Beautiful Dreamer PJ Pants.